Those spikes in interest are savings-mad shoppers looking for promo codes during Black Friday and Cyber Monday - more on that later. Beyond those spikes, there’s an ever-increasing trend of internet users searching for savings. That interest is why we got really excited to hear AdWords was introducing promotion extensions. 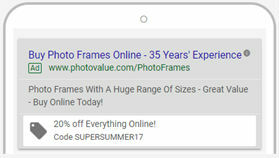 Promotion extensions are one of the latest ad extensions to launch in AdWords. 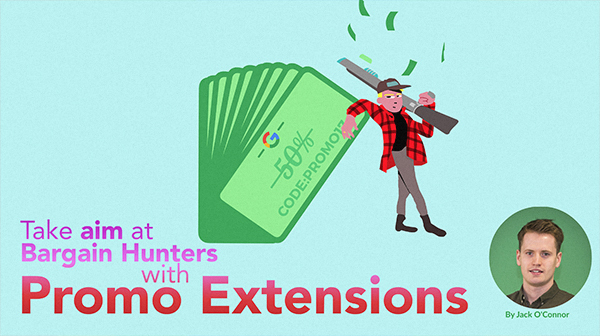 In short, these new extensions appear in your Search ads like regular extensions and display both special offers and the codes customers will need to redeem them. This new ad extension will appear in desktop, tablet and mobile SERPs. Zoran already showed you the impact of visual sitelinks and in doing so touched on how adopting sitelinks in general often brings increased CTR. Promotion sitelinks have some additional punch as, based on the search trends above, we already know online shoppers like to bag a bargain. At Wolfgang Essentials, Wil Reynolds highlighted the importance of giving your customer what they’re looking for. We’ve already established that online shoppers are searching for promo codes and discount codes so naturally we were excited to see promotion extensions appear in AdWords. Everything about this new AdWords innovation seems to make sense, so we set about testing them out. Here are the results. During the period we tested promotion extensions with Photovalue, the account generally saw a 1.54% CTR. During the same period, campaigns with the new promotion extensions brought a massive CTR of 6.12%; up nearly 300%. With the increased awareness around special offers, promotion extensions also led to a 24% increase in conversion rate versus traffic acquired without this new ad extension. These new extensions should be a definite consideration if your brand is taking part in one of the biggest shopping days of the year. Online shoppers spend time looking for bargains. With promotion extensions, you can attract their clicks and give them the bargain they’re looking for.